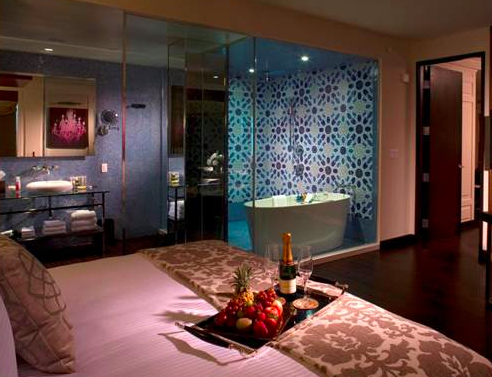 Although best known for its sophisticated, edgy vibe, Andaz San Diego also has a sensual side. Modern romantics will find that a couple’s Valentine’s Day getaway serves up plenty of romance in signature Andaz style. This year the day of love also falls on the President’s Day holiday weekend so there’s one more day to relax and celebrate. Love Goes Around: The hotel’s “Love Goes Around” romance package will help fan the flames of love this Valentine’s Day. For current prices, call the reservations desk at 619-849-1234. To add to the fun, this package also features a special “Cookies and Dream” amenity, which includes homemade biscotti and fresh strawberry jam. Sweet Dreams: The ultimate romantic getaway at Andaz San Diego begins with one of its signature guest rooms featuring custom fixtures, flat-panel televisions and generously sized, glass-enclosed bathrooms. Couples will enjoy contemporary comfort with a balance of modern and classic style throughout their love-nest. Guests can also gift themselves with an upgrade to one of Andaz’s luxury suites including the Andaz Star Suite, Cabana Suite and Sweet Suite. Toast: Before dinner, couples can cozy up at the ultra-chic Andaz Wine Bar and toast their union. Guests can choose from 88 wines by the glass poured from an innovative Wine Station system. A selection of cheese plates and gourmet appetizers are available to complement the experience. Indulge: Andaz San Diego’s RoofTop600 is the perfect place for breakfast or lunch. Enjoy stylish signature cocktails poolside during the day or by the firepit at night as couples snuggle beneath the stars and enjoy breathtaking views of the San Diego skyline. For a more intimate setting, guests can cozy up in the comfort of their own room and enjoy in-room dining catered to their personal preferences. After dinner, couples can head back to RoofTop600 to experience one of San Diego’s premiere nightlife destinations. Andaz San Diego is an urban escape known for friendly and uncomplicated service, sophisticated design and unpretentious style. Located in the heart of the Gaslamp Quarter, the cornerstone of the property is a 159 room hotel with 17 suites, each with luxurious bedding, custom fixtures, and local bath amenities. Guests enjoy complimentary welcome beverages while being checked in via iPads® as well as complimentary amenities such as wireless Internet, select non-alcoholic beverages and snacks, 24-hour gym, and wine tasting in the lounge each evening from 5:00pm-8:00pm. Andaz San Diego offers guests the Andaz Wine Bar and RoofTop600, a sultry rooftop bar and restaurant with stunning skyline views, lounge pool, and private cabanas. Live DJs from 9:00pm – 1:30am and bottle service set the tone for Friday and Saturday at RoofTop600 when it transforms into one of the premier ultra-lounges in San Diego. Additional amenities include 20,000 square feet of flexible meeting and function space. For more information about Andaz San Diego, visit www.andazsandiego.com or call 619-849-1234. Socialize with Andaz San Diego on Facebook and on Twitter and Instagram at @AndazSanDiego.